Gorgeous seating for any style garden. Inspired by the popular Horizon Arch, the Meridian Pergola Seat is an elegant piece of furniture that combines relaxed seating with subtle decorative features. The wooden bench seat is comfortable and stylish, with its trellis side panels adding a spot of privacy. The pergola frame is Ideal for a selection of climbing plants, including traditional favourites such as clematis, roses and wisteria as well as contemporary specimens such as climbing hydrangeas and campsis. 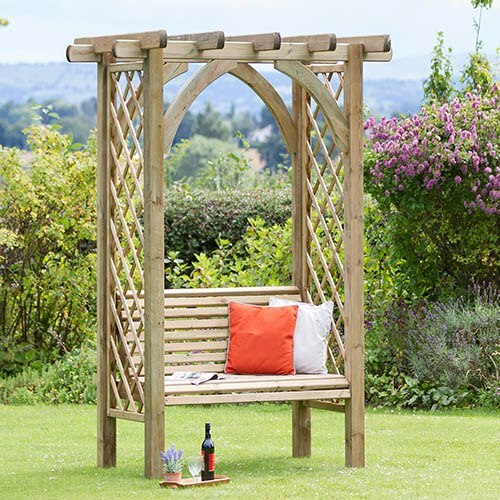 Suitable for any style garden, the Meridian Pergola Seat features pressure treated and FSC® Certified wood and comes with a 10-year guarantee against rot, which means its strong, durable and can be used year after year. Dimensions: 1.80m x 1.30m x 2.20m, assembly required - This product is 2-person assembly.Inspired by our popular Horizon Arch, the Meridian Pergola Seat is an elegant piece of furniture that combines relaxed seating with subtle decorative features. The wooden bench seat is comfortable and stylish, with its trellis side panels adding a spot of privacy. The pergola frame is Ideal for a selection of climbing plants, including Clematis and Climbing Hydrangea.